We are happy to announce a number of significant improvements to elastic database query in Azure SQL Database. Most notably, elastic database query now supports querying across databases in Azure SQL Database. This makes possible common cross-database querying tasks like selecting from a remote table into a local table. It also allows for richer remote database querying topologies like the one illustrated in the following figure where a number of databases need access to each others tables. This new cross-database querying capability complements the existing support in elastic database query for horizontal partitioning (sharding) which is illustrated in the following figure. In contrast to SQL Server on-premises, elastic database query in Azure SQL Database now unifies both vertical and horizontal partitioning under one common concept and the same surface area. Parameter support in the sp_execute_fanout procedure. See the following paragraphs for more details on those enhancements. Elastic database query now provides access to tables in remote Azure SQL Databases through a simple extension in the DDL for external data sources and external tables. You can define an external data source that, for instance, provides access to a remote database which stores reference data shared among all databases of your data tier. You can also easily copy the contents of tables from a remote database to another using a INSERT INTO... SELECT statement. Based on this external data source, you can now define an external table that provides remote access to a ZIP codes table located in the ReferenceData database. After this simple one-time setup, your queries can now access the remote ZIP code table from any Azure SQL Database where the external data source and external table have been defined. Elastic database query is now also available in the Standard performance tier of Azure SQL Database. This significantly lowers the cost of entry for cross-database querying and partitioning scenarios in Azure SQL Database. Due to the smaller DTU limits in the Standard tier, it can take up to one minute to initialize elastic database query when you run your first remote database query. Initialization latency for elastic database query is an area we are actively working on. The experience will improve over the next couple of months. Several important scenarios require the ability to name your external table differently than the original table on the remote database. Any scenario where a local table already exists with the same name as your remote table are examples of that. All of these scenarios require the ability to use an alias for the remote table name. For instance, consider a scenario where you want an external table definition to aggregate a DMV (Dynamic Management View) across a horizontally partitioned (sharded) data tier. Previously, this required complicated workarounds such as effectively renaming the DMV using a view on the remote databases and referring to the view from the external table definition. This was necessary since DMV names or catalog names already existed locally and could not be used directly as external table names. Elastic database query provides the stored procedure sp_execute_fanout to invoke stored procedures and functions on remote databases. Our recent improvements to Azure SQL Database now align the signature of sp_execute_fanout with the familiar signature for sp_executesql. This allows passing regular SQL parameters into invocations of sp_execute_fanout and will be available early next week. 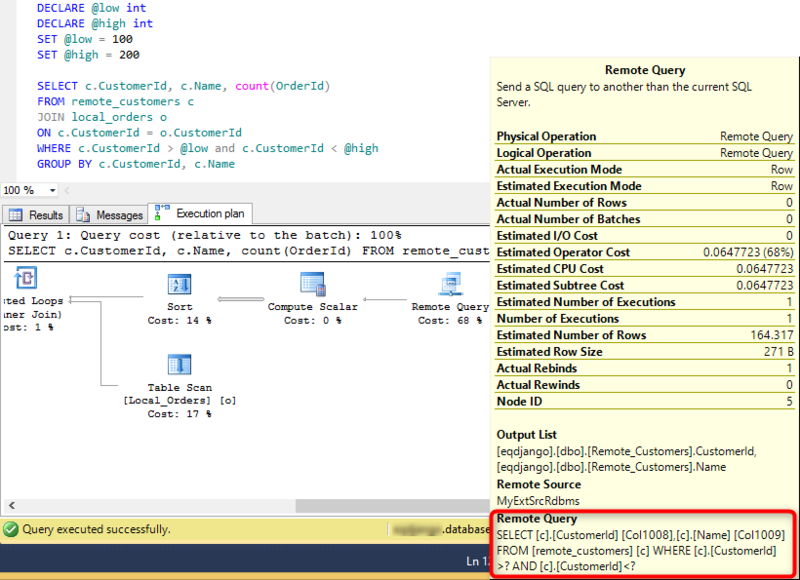 A quick look into the query plan for the query above confirms that the range predicate on customer ID in the WHERE clause made it successfully into the remote query operator. Finally, we also made transferring large numbers of small rows with elastic database query more efficient. Our tests show performance improvements for queries over external tables by a factor of more than five when transferring 100,000 rows or more. 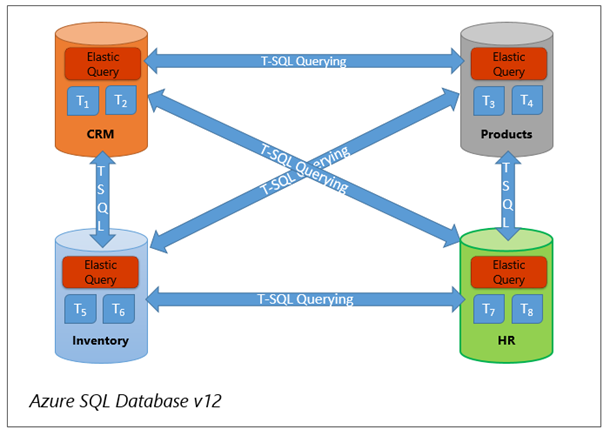 To learn more about all the improvements discussed above, please visit the elastic database query overview.